Their brother was shot by Sacramento police in 2016. Stephon Clark's death has reopened the wound. The siblings of Joseph Mann say the latest fatal police shooting of a black man by Sacramento police shows that not enough has changed. 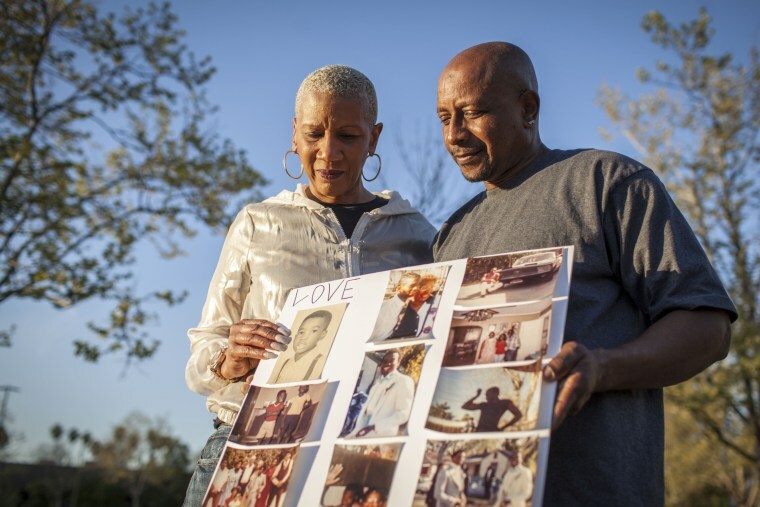 SACRAMENTO — When the news of Stephon Clark’s death broke on March 18, it arrived somewhere between entirely expected and just about unthinkable. Queasiness came with every news report and sidewalk conversation, carrying word that Sacramento police had shot and killed Clark, an unarmed African-American whom they suspected of attempting to break into cars. Just 20 months earlier, the Mann family received similar news about their own brother, also a black man shot to death by members of the same police department. Joseph Mann, 50, carried a knife with a 3½-inch blade. That’s a question that many in this city of just under half a million people are asking following the death of Clark, a father of two toddlers whose violent end has provoked days of protests, blockades of Sacramento Kings games and talk of continuing demonstrations. City leaders say they have been working for years to improve community and police relations and to minimize the use of force — reforms that gained momentum following the 2016 death of Joseph Mann. The most concrete result: The two officers who fired 20 shots at Clark as he stood in his grandmother’s yard were wearing body cameras. And the city promptly released the official video, something that took more than two months when it came to the dash-cam video in the Mann case. As in many other cities, complaints about inequitable treatment by the police are nothing new in Sacramento. Long-running reports of racial profiling led the city in 2000 to undertake a comprehensive review of traffic stops. The city formed a police Racial Profiling Commission in 2004 to monitor the problem. But following a report confirming that police officers were twice as likely to pull over black motorists as non-blacks, the commission accomplished little, critics said. In 2015, the city formed a new panel — the Sacramento Community Police Review Commission — that was filled with community members, rather than police officers. The new commission has the ability to recommend, but not force, changes in “policy, practice or procedure.” The city also created an Office of Public Safety Accountability, with the long-term goal of minimizing the use of deadly force. A 2016 audit found that the department's sworn police officers were 76 percent white, 10 percent Latino, 3 percent black and 7 percent Asian. The city's population, according to the same audit, is 35 percent white, 27 percent Latino, 13 percent black and 18 percent Asian. While acknowledging that there is more to do, police officials want credit for what they have already done, pointing to an explorer program that encourages young people of color to become officers, a youth boot camp and 200-member Police Activities League rugby team that won a national championship. But the streets of South Sacramento, where Clark died, are roiling with impatience and calls to action. People don’t oppose more talk, and public hearings, but they insist on something more. This stems from a sense of deep inequity — that the economic boom sweeping some parts of the country has passed them by, leaving too few jobs and a lack of affordable housing. Residents of working-class Meadowview, near where Clark died, bristle at the mention of businesses that won’t come to their neighborhood — like big name, full-scale supermarkets — and the ones that seem all too abundant, like check-cashing stores, dialysis centers and, most recently, a proposed day counseling center for federal prison parolees. The latter would come courtesy of America’s biggest for-profit prison company. The last explosive case involving Sacramento police centered on Joe Mann, a 50-year-old who family members said suffered from schizophrenia and who had worked for many years at a supermarket, before becoming a counselor for the state Department of Corrections and Rehabilitation. He was the youngest of five children brought by his parents from an economically distressed town in New York’s Hudson River Valley. In official Sacramento police reports from the day he died, Mann was described as an unstable, ranting man, who a 911 caller said was carrying a knife and a gun. The first police unit on the scene in the crime-heavy Del Paso Heights neighborhood kept its distance and tried to talk Mann down. But a second cruiser arrived and those officers quickly escalated the encounter. One said “f--- this guy” and soon tried to ram Mann with his patrol car, a dashboard camera revealed. Moments later, in an encounter that isn’t clear on camera, the two officers are out of their car and shooting. They hit Mann a total of 14 times. His knife was found at the scene but not a gun. Police initially emphasized the threat posed by Mann — stressing that he had made karate-style movements as he moved away from police and failed to comply with commands to stop. A spokesman said Mann turned toward the officers and raised the knife before the officers opened fire. After Mann’s death, his family began a campaign that relied heavily on the media to bring attention to their case. When a witness’s cellphone video showed the police cruiser trying to ram Joe Mann, it created pressure on the department, which had hesitated to release its own video, said Robert Mann. Fifteen months later, Sacramento’s first black police chief sent a two-paragraph letter to the family. After “thoroughly investigating,” the department found “improper conduct by our employees,” wrote Chief Daniel Hahn, adding that “appropriate action has been taken.” But the chief said state law prohibited him from providing further details. Investigations by the family, The Sacramento Bee and others revealed that one of the officers, John Tennis, had previously been prevented from carrying a gun following accusations of domestic violence and child abuse. He had to get clearance from a judge to allow him to carry his weapon on the job. The Sacramento County district attorney's office determined in January 2017 that the officers had not committed a crime when they shot Mann. Mann’s father, William Mann Sr., reached an out-of-court settlement in February 2017 that paid $719,000, sources told The Sacramento Bee. The dead man’s siblings filed their own lawsuit in federal court, which the city is trying to have thrown out. But Mann’s four brothers and sisters said they are persisting, because the case is about more than money. “They could have tazed him, or bean-bagged him, but none of that was brought into the picture,” said Robert Mann, 54, who works for a company that assembles electric utility trucks. “All they did was murder my brother. After Clark’s death, the Manns have done a handful of interviews, but said they mostly stayed away from the marches and public protests. They are letting the media put out word to the Clarks that they are ready to talk, if and when the time seems right.